The study is based on a long-term observation of more than 950 people as part of the population-based cohort study MONICA/KORA. 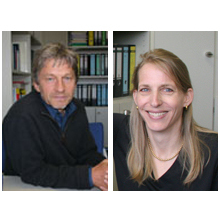 The work was conducted by Dr. Rebecca Emeny as part of the Mental Health working group headed by Prof. Karl-Heinz Ladwig, Institute of Epidemiology II (EPI II) at the Helmholtz Zentrum München (HMGU). Data was analyzed from questionnaires on psychological stress at work and concentrations of inflammatory biomarkers in the blood. The results showed that healthy workers who were exposed to stress at work displayed significantly elevated inflammatory parameters and faced twice the risk of cardiovascular diseases. More than half of the participants in the study stated that they experienced psychological strain and stress at work. Stress is regarded as a cardiovascular risk factor. Its consequences are communicated directly via activated messenger substances as well as indirectly via unhealthy stress-related behavior. In particular, the scientists found a clear association between stress and elevated concentrations of CRP (C-reactive protein), which is an inflammatory marker, and were thus able to demonstrate a stress-related inflammatory reaction in the body. Moreover, job stress led to harmful psychological effects such as depression and sleep disturbances as well as to unhealthy behavior, for example, physical inactivity. Doing sports regularly, for at least one hour per week, significantly reduced inflammatory activity. However, the differences in terms of health risks between people who suffered from work stress and those who did not still remained. With their analysis, the scientists at HMGU have made a substantial contribution towards a deeper understanding of stress-related responses in the body. “The insights gained from this study form important starting points for finding preventive measures that will protect against stress-related diseases such as coronary heart disease,” says Dr. Emeny, first author of the study. Environmental factors and lifestyle play a major role in the development of common diseases in Germany such as cardiovascular diseases and diabetes mellitus. The aim of the Helmholtz Zentrum München is to develop new approaches for the diagnosis, therapy and prevention of the most common diseases.